Heavenly blog! : No. 1565: Miserable appearance of the police and prosecution force in Norway that indirectly defend Nazis, and try to take me who is opposed to Nazism! No. 1565: Miserable appearance of the police and prosecution force in Norway that indirectly defend Nazis, and try to take me who is opposed to Nazism! Miserable appearance of the police and prosecution force in Norway that indirectly defend Nazis, and try to take me who is opposed to Nazism! When Diego Maradona put in the crucial scoring against England in the World Cup, he did it by hand. This is of course cheating and the score should never have been approved. Likewise, the judgment against me is cheating from a to. They have directed me to one thing, debated this in court, and wrote in the verdict something completely different and condemned me for this. Although this has not been dealt with in court. When Brynjar Meling addresses this in his appeal, the Norwegian Supreme Court newspaper appealed when it was revealed to be annoying. This is cheating from the police and the courts against me and the heavenly blog. That Maradona and the judgment against me are approved, of course, is cheating even if it has been approved. 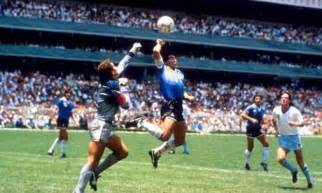 That Maradona called this to God's hand and against me they call for a fair judgment, just deceiving and cheating even worse and uglier! In essence, it is a very sad story here in Norway between the police / prosecution force show the Jews and Nazism. In many ways, there are "blood" in the hands of the police how they were taking Jews during World War II. As well, after the Second World War many who had been Nazis and police were seen between their fingers. They either received short sentences and were quickly reinstated in their positions, not least by the police and in public. The right thing would have been to slap others and let those who supported Nazism be banned from such trusted positions. That whole was a form of cheating and deception! Now the story repeats itself that the police and the prosecution force are completely out on the "slippery ice" and do such cardinal errors that only show their own hate and impotence! Like the southern part of the country where the police left their protected hand against the Nazis and their shabby demonstration against gay men who are scary of something completely different. Such as Jan Aage Torp's review of me is a skull skull for his against me and the heavenly blog for my preaching against upbringed preachers! Here in the case with me and them, they do not understand the most elementary that the actual review against me and the heavenly blog is fictional. It's Torp's hatred against me and the heavenly blog that underlies it all. Why does Torp hate me and the heavenly blog like that and want to get it removed? This is because I have pointed out that he has been reissued and lives in horror, not for any other reason. Everything but this will be a total discovery to believe and think. There is no person in this country who has been in as many verbal clans as he and who has returned with stronger verbal words and expressions than those who have attacked him. That's why he thinks it's punishable to call him for leprosy and psychopath is just a lie. It's a scalpel to make me judged because I assert in the word of God that "Apostle and Pastor" Jan Aage Torp is a whore! When Torp notified me and in the actual verdict there was nothing in crowd at all. But when Torp notified me and police "believed" on him, there was a lot of writing from Torp's side and his "weapon carriers" that I responded to. There have been lots of it.Then they use this to me, talk about being pillared! The verdict against me is also pillar tent and scam! Both from the judgment of the district court and the court of law, I write that I seem to be driven by a "personal pursuit motive". Firstly, this lie, I have never sought Torp or his meetings or in any other way. We have not been asked by the judges in the district court or the court of law about this. If this is the basis of the judgment, it is essential in the judgment. Then it is both the pillars and cheating to write this into the verdict, as this has not been dealt with in court, as Brynjar Meling writes in his inscription clearly and clearly. That's why the appeal was rejected by the Supreme Court that the attorney to Attorney Brynjar Meling put in writing wrote the judgments of both Oslo District Court and Borgarting lagmandrett chock matt !? What's sad to see is that it's all about polite and prosecution. Both in some cases, like the Jews during World War II, reconstruction of the country where many former Nazis gained their jobs. So over to me and the Heavenly Blog, where they go hard on me and the Heavenly blog. But they can also protect Nazis who have an idology, spreading hatred and death wherever they come. Yes, the police and prosecution force in Norway is moving at such a low level that one must compare them with such primitive states as North Korea and Congo. It tells me that the verdict written against me and the heavenly blog really is not worth the paper it's written at once, as it's completely false, fabricated and it's a cheat sentence! The judges have written in the judgment afterwards what has not been dealt with in court and judged me for this. This is scam and cheating.